At TGR Elite Athletic Training Center we believe that the physical activities associated with the sport of gymnastics not only builds strength, flexibility and coordination, but has a profound and positive effect on a child’s self esteem & psychological development. Studies show that regular physical activity can increase a person’s brain power. 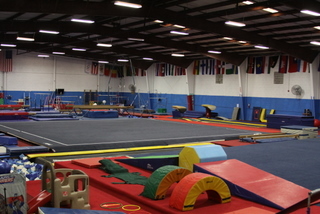 TGR offers gymnastics classes for children ages 1 through Adult. Our Small & Tall classes are for ages 1 to 4, to introduce the sport of gymnastics as a tool for developing a child physically and mentally. We offer girls and boys gymnastics classes for ages 5 and up, and competitive teams when they are ready for that next step. Did you know that Trampoline is an Olympic sport? We offer classes and teams in Trampoline and Tumbling. We are proud to be the only gym in Palm Beach County to offer Parkour Free running, the hottest new sport around the world. Our tumbling classes progress students from cartwheels to back tucks, and improve their cheerleading skills. Come and see what we offer and JOIN THE REVOLUTION ! At TGR, the facilities’ coaches, staff, parents and fellow gymnasts support the dreams and goals of each other. Our team coaching allows all team members the benefit of the expertise of each of our 6 upper level coaches and our special visiting coaches from all over the world.